As you can see, the background is sort of squeezed. Anyone can shed a light on why the background resizes? entry inside <Activity > tag in manifest file. I think it was caused by having ScrollView inside the Activity. I faced the same problem while developing a chat app, chat screen with a background image. android:windowSoftInputMode="adjustResize" squeezed my background image to fit the available space after the soft keyboard was displayed and "adjustPan" shifted the whole layout up to adjust the soft keyboard. The solution to this problem was setting the window background instead of a layout background inside an activity XML. Use getWindow().setBackgroundDrawable() in your activity. Here is the best solution to avoid such kind of problem. Through android:windowSoftInputMode="adjustPan" giving bad user experience because through that entire screen goes on top (shift to top ) So, following is one of the best answeres. In case if somebody need an adjustResize behavior and don't want his ImageView to be resized here is another workaround. Just put ImageView inside ScrollView => RelativeLayout with ScrollView.fillViewport = true. I encountered the main problem when working on my app. At first, I use the method provided by @parulb to solve the problem. Thank him a lot. But later I noticed that the background image is partially hided by actionbar (and statusbar I am sure). This small issue is already proposed by @zgc7009 who commented below the answer of @parulb one year and a half ago but no one replied. I worked a whole day to find out a way and fortunately I can at least solve this problem perfectly on my cellphone now. I am using Nexus 5. I found a way to get height of actionbar in xml but not the statusbar, so I have to use a fixed height 75dp for top padding. Hope anyone can find the last piece of this puzzle. I suffered similar issues, but it seems like using adjustPan with android:isScrollContainer="false" still didn't fix my layout (which was a RecyclerView below a LinearLayout). The RecyclerView was fine, but every time the virtual keyboard showed up, the LinearLayout re-adjusted. This tells Android to basically leave your layout alone when the virtual keyboard is called. More reading about possible options can be found here (though oddly enough, it doesn't seem like there's an entry for adjustNothing). I faced with this problem, when my background image was just a ImageView inside a Fragment, and it was resized by the keyboard. My solution was: using custom ImageView from this SO Answer, edited to be compatible with androidx. * Created by chris on 7/27/16. After studying and implementing all available answers, here I am adding a solution. To use it as background to my Fragment class, I set it as first element to FrameLayout. I faced this same problem before but no solution worked for me so long because i was using a Fragment, and also getActivity().getWindow().setBackgroundDrawable() was not a solution for me. Solution which worked for me is to override FrameLayout with a logic to handle keyboard which should appear and change the bitmap on the go. And I used it as like an usual FrameLayout's background. if you are set image as windowbackground and ui going to stuck. then there may be possibility you are uses drawable which is in single drawable folder, if yes then you have to paste it in drawable-nodpi or drawable-xxxhdpi. Not the answer you're looking for? 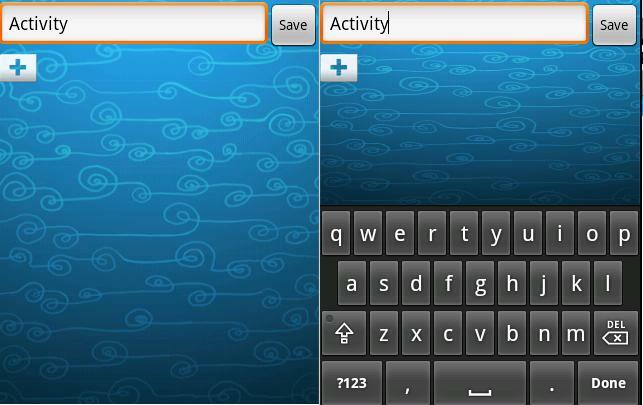 Browse other questions tagged android view android-linearlayout or ask your own question.